The U.S. consumer Product Safety Commission has announced that Fisher Price is recalling 63,000 infant motion seats. The products are sold under the Soothing Motions Seats and Smart Connect Motions Seats brand names. The model numbers involved are CMR35, CMMR36, CMR37, DYH22 and CMR39. The motors in these infant seats have a tendency to overheat resulting in a fire hazard. These products were sold by such stores as BuyBuyBaby, Target, Toys R Us, and Walmart. The seats were also sold on line by Amazon.com and other websites from November 2015 through October 2017. Consumers should stop using these products and contact Fisher Price for a full refund. Consumers can contact Fisher Price by calling 1-800-432-5437 or go on line to www.service.mattel.com and click on “Recalls and Safety Alerts” for additional information. The recall number for this campaign is 18-015. A photo of the seat is shown below. On October 1, 2015 BSH Home Appliances recalled 149,000 dishwashers due to a faulty line cord that could overheat and ignite. This recall has been recently expanded to included another 408,000 units. The dishwashers were sold under the Bosch, Gaggenau, Jenn-Air, and Thermador brands. The model and serial numbers for each brand included in the recall are shown below. Consumers are requested to stop using the recalled units and contact BSH Home Appliances for a free inspection and repair. Consumers can call 1-888-965-5813 or go line at the brand websites www.bosch-home.com/us, www.gaggenau.com/us, www.jennair.com, or www.thermador.com and request additional information. The recall number for this campaign is 18-013 The dishwashers are shown below. Amazon has recalled 260,000 portable power banks due to fire and chemical burn hazards. The unit’s battery can overheat and ignite. This recall applies to six different versions of AmazonBasics’ portable lithium ion battery chargers/power banks. The power banks can be identified by the black case imprinted with the AmazonBasics’ logo on the front. In addition, the recalled units have one of the following product identification numbers: B00LRK8EV0, B00LRK8HJ8, B00LRK8170, B00LRK81V0, B00LRK8JDC, and B00ZQ4JQAA. Consumers are requested to stop using the power bank units and contact Amazon for instructions on how to return the unit and receive a full refund. Amazon can be contacted by calling 1-855-215-5134 or visiting https://amazonpowerbank.expertinquiry.com . The recall number for this campaign is 18-728. A photo of the power banks is shown below. Goodman Company has announced the recall of 534,000 packaged terminal air conditioners (PTACs) because the outdoor fan motor can overheat. Overheating of the motor can pose burn and fire hazards. This recall applies to units with the Goodman, Amana, York International, and Energy Knight brand names. The unit models that are included in this recall begin with the following prefixes: EKTC15, EKTH15, PMC15, PMH12, PMH15, PTC15, PTH12, PTH15, UCBY15, and UCYH15. The first four digits of the serial numbers are in the range between 1001 and 1709. The units were installed in such places as motels, schools, hotels, and apartment buildings. Consumers should contact Goodman for a free repair kit and installation by an authorized technician. Goodman can be contacted by calling 1-888-803-0512 or on line at https://www.amana-ptac.com. The recall number for this campaign is 18-113. A photo of the unit is shown below. Insinkerator has recalled its sink top accessory switch for garbage disposals due to a problem with water getting into the power module. When this happens, the power module can overheat and ignite. The models that are involved in this recall are 76703, STS-SOSN, 78251 and 74300. 1,400,000 units are affected. Garbage disposals activated by a wall switch are not included in this recall. Consumers should stop using the switch and contact Insinkerator for a free replacement. Insinkerator can be contacted by calling 1-855-215-5695 or on line at www.insinkerator.com. The recall number for this campaign is 18-116. A photo of the switch is shown below. What’s Going on With Carrier and Goodman? For a number of years, the Carrier Corporation has been manufacturing air conditioning equipment and selling their products all over the world. Virtually everyone in the HVAC industry and a large part of the consuming public is familiar with the Carrier name. To a lesser extent, the Goodman Company has also been manufacturing air conditioning equipment. Although the Goodman Company is not was well known as Carrier, the two companies manufacture some of the same products. Case in point: packaged terminal air conditioning units or PTACs as they are more commonly known. These are units that are commonly found in motel rooms. Recently, both companies recalled some of their PTAC units, Carrier on December 22, 2015 and Goodman on February 17, 2016. But, the most troubling commonality is that the recalls are for the same problem. That is, both companies recalled their products because their PTACS were equipped with line cords that could overheat and pose a burn hazard to consumers. The only reason that line cords overheat is because they are sized too small for the unit’s load; i.e. the unit is drawing more current than the line cord can handle. How does that happen? This problem is not something that has been recently discovered. It is not something that belongs to new technology innovations. Any company that has been manufacturing an electrical device for any length of time has to know full well what the consequences are of undersized wiring for a specific load. So, again how do companies like Carrier and Goodman get it wrong? If the problem can’t be in the lack of knowledge, it has to be in the manufacturing process. Maybe it’s time for some worker retraining. An investigation has just been completed into the cause of the failure of an oven glass door. The situation was such that the owner had started the self cleaning feature of the oven. After a short while, the owner heard popping and cracking noises coming from the oven. Upon investigating, the owner found that the interior door glass pane had shattered. It appeared that a control malfunction caused the oven to overheat and expand the glass beyond its’ railing space. The result was the failure of the glass. 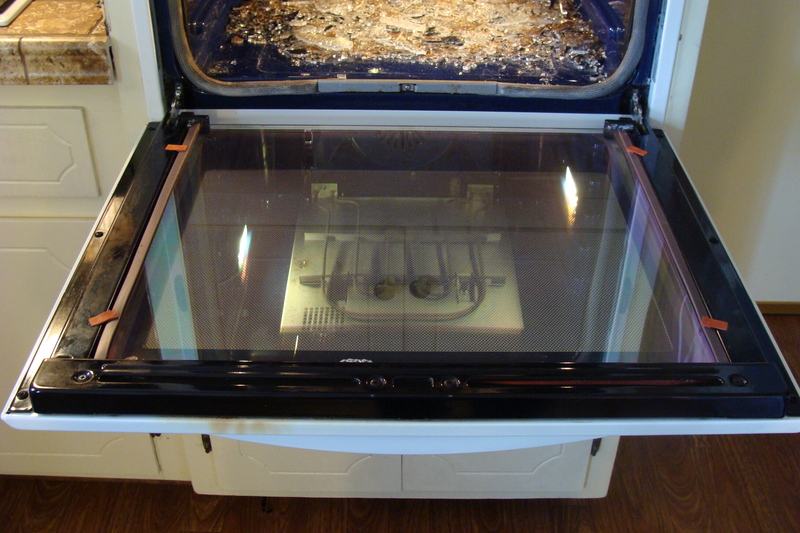 The glass was part of a Kitchen Aid built-in oven, model # KEBS177SWH02. Has anyone experienced a similar failure? A photograph of the oven door is shown below.